I have changed the code for the badge so that it will take you to the master list now that it is up. I have had some questions and rather than try and reply to all the individual messages I am going to answer them here. I want to get involved, what do I do? Read through the rest of this post and then have a look at the explanation post here. It is a guide line on what to do, you can run the auction/raffle anyway you like, this is just to give those who have no idea a starting point to go from. Do I have to use Global Giving? 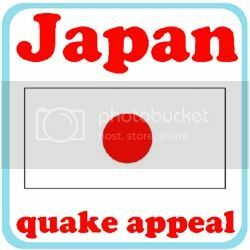 When I decided to get the ball rolling on this auction appeal not many of the charities had got pages set up for the Japan Quake Appeal which was one of the reasons why I chose to go with Global Giving. If you are running an auction or raffle I don't think it matters which charity to decide to go with as long as the people that are buying 'tickets' can post proof of payment. For those running an auction please ask the winner to forward the receipt after they have donated the winning amount. Global Giving doesn't accept donations less that $10 what should I do for me raffle? How do I know if someone isn't using the same ticket more than once. This is a tough one, we have to believe that most people are honest. Please put in your post a gentle reminder that a new donation is needed for each entry. My blog isn't very popular, I don't have many followers. I have put up my blog post for the auction/raffle now what? Post your link in the comments section on the master post and I will add it to the list then tell all and sundry about the appeal. When the appeal is over send me an email with the amount you raised (and which currency) so that I can reckon up how much we raised together. If you have other questions, please post them in the comments section of this post, it is easier that way for me rather than trying to sort through all the emails. Thanks. Thanks so much for organizing! I am planning to post the raffle of the bundle of baby goods tomorrow on my site... still following up with all the folks who are contributing items. Hi Jo, I'm working on a raffle at the moment. So I'll make a comment in a bit. IS THERE a time frame for this?? or do we choose our own?? Thanks. Hi Jo, I'm behind, but still want to participate. Could I join late?